We’re pumped to announce that you will be able to spend your New Year’s Eve with us this year! 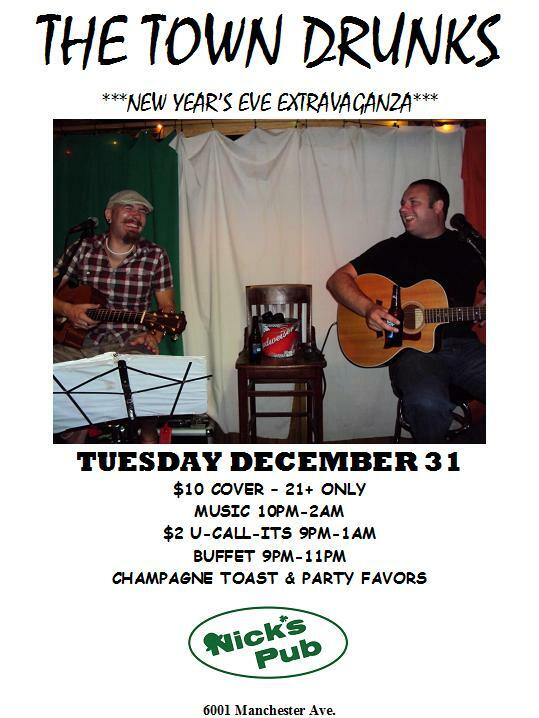 Nick’s Pub is throwing a huge bash and yours truly will be providing the tunes. $10 gets you in for $2 U-Call-Its from 9pm-1am, buffet from 9pm-11pm, midnight champagne toast and party favors plus you get us from 10pm-2am. It’s the biggest party of the year and we expect to see all of our pals there. We hate drinking alone, as you well know. Well our St. Louis Cardinals are in the midst of the NLCS run! With that in mind, our schedule is becoming spotty so please make sure to check our Schedule page to see where we will be and if certain dates have been cancelled due to ball games. Go Cards! Welcome to The Town Drunks’ official website. It’s good to have you with us. Browse around, enjoy the sights and feel free to contact us with any questions, queries, health tips, recipes or general feedback.